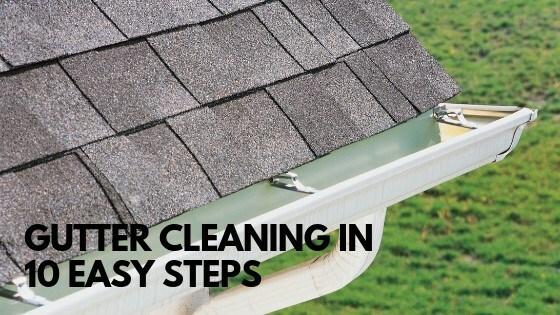 Gutter cleaning can be a tedious chore but an extremely necessary one, because keeping them free from debris means they can work properly in protecting your home. Keep in mind that dirty gutters and downspouts can lead to flooding and water damage to your home, foundation, and walls. So cleaning them at least every spring and fall and as needed can save you tens of thousands on costly repairs. Here are 10 easy steps to keep your gutters clean and redirect all rainwater away from your home properly. Wear thick gloves, safety goggles, and a dust mask to ensure you are safe and protected from bacteria or other hazards that may be lurking in your gutters. 2 – Start near a downspout. Using a stepladder for safety, position yourself by a downspout. You may need an extension ladder if your home is quite tall. If so, place a 2/4 in the section of the gutter you’re working on to protect it. Bring a bucket or garbage bag with you to collect debris. You can also place a drop cloth under your working area for easier cleanup. With a trowel or plastic scoop, start shoveling debris into your refuse container and work your way down the gutter. Never do this with your bare hands for safety. 4 – Flush with a hose. Finer materials or sticky gunk may have been left behind so be sure to flush your gutter from the farthest end with a pressurized hose but be careful not to splatter the side of your house. If there are some spots that aren’t floating away, use a stiff brush to scrub them before flushing the gutter again. If you notice that the water is backing up at the downspout, there might be a clog. 5 – Detach the pipe. Be sure to detach the pipe if it runs underground before you start cleaning your downspout. It will prevent pushing the clog further. 6 – Remove the clog. You can either try to loosen the blockage by running a pressurized hose up the downspout with water on or use a plumber’s snake to remove it. 7 – Reattach the pipe. Be sure to reattach the pipe securely to prevent leaks. 8 – Rinse the downspout. Run water through the downspout from the top of the gutter to clean it out and ensure the clog is removed. Having strainers installed can help keep large debris from blocking the pipe. If you already have them, be sure to clean it to prevent clogs. And if you don’t, consider installing them. 10 – Proper and regular maintenance. Check the water flow while you are rinsing your gutters. If it’s not draining quickly, then the slope may be off. Gutters should drop ¼ inches every 10 ft. If there is no visible damage or missing parts, start working section by section and detach the hangers. Then adjust the slope so it will drain properly. Finally, reattach. Ensure you also check for leaks after every storm. Moreover, gutters can rust so if you notice paint chipping or there are leaks through the metal, be sure to replace the faulty section with a new one immediately to prevent more serious damage. Sounds easy and fun? Well, kind of. But if you’re not comfortable to be on top of a ladder, it would be best to hire a pro like Get Superior Cleaning to get the job done. Contact us today at (205)427-5296 and let us get that gutter of yours cleaned up!